Have you ever desperately wished you had a way to get answers to the big questions in life? What is the next career move? Is the money ever going to come? The answers are always inside of you. Sometimes, it’s hard to pull those answers out, though! And, even if you do, it’s really easy to second guess yourself. Not only do we want to get these answers for ourselves, but if we teach yoga, then students often ask us these questions… and they want us to provide the answers! Over the years, I’ve had students ask me whether they should get a divorce, move house, quit their job, start a teacher training, and much more. If you’re a teacher, I know you’ve had this happen to you, too. The reality is, if we’re trained as a yoga instructor, we don’t really have the skills to provide them with these answers! Not to mention, answers to those questions should never come from someone else. They should always come from within the individual. How do we help them get their best answer? The technique might surprise you. The tarot deck is my favorite (and successful!) tool for getting answers to the most pressing questions. 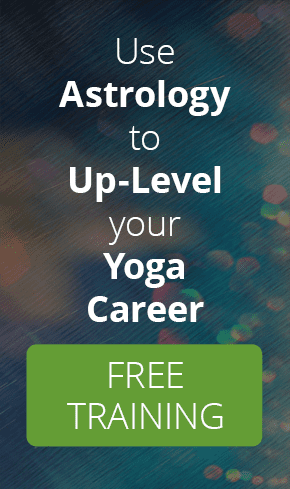 You hear me talk a lot about the power of astrology as a complementary tool to yoga. Nothing is better than astrology at getting to know yourself and seeing the long-term picture. Sometimes, though, we need answers right now. For that, having a tool like the tarot is priceless. The tarot deck helps to bring out what is alive and active within your psyche. It literally lays all your cards on the table. Because the answers are within you. You just need some way to bring them out! I want to teach you a way that you can do this right now. Join me for a webinar that teaches you more about the tarot (I’ll demystify it for you! ), and a technique for decoding the deck and bringing it into your personal practice straight away. In this week’s Facebook Live, we talked about the symbolism in the Tarot cards, what the symbols mean and how to decipher their meaning. I look forward to sharing yet another incredible skill set that helps you harness the power of yoga and make more impact with your spiritual career!